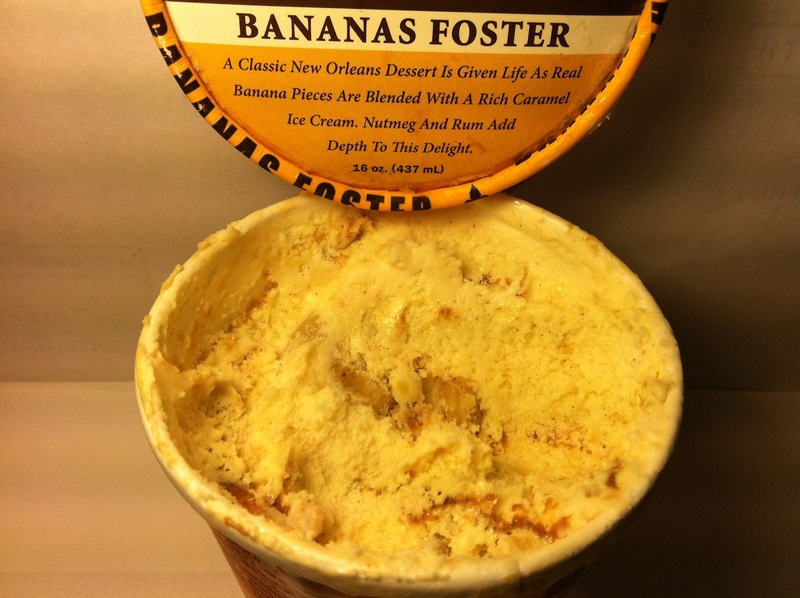 So I move onto another New Orleans Ice Cream Company review from the free shipment of pints that I received and that leads me to this review of the New Orleans Ice Cream Company Bananas Foster Ice Cream. Before I dive into this review, I'll just lay it out there for people that aren't regular readers of the blog (or may not remember)...I HATE bananas. I eat maybe two of them a year when there is nothing else available to eat, but I try my hardest to avoid them at all costs. Because of that, just know that I'm going to be biased against this one going in. That said, this pint contains four half-cup servings at 200 calories per serving. 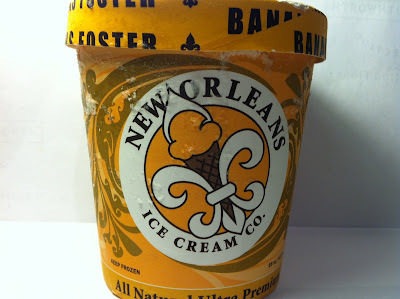 This pint's of a classic New Orleans dessert is made up of a base of caramel ice cream that is then mixed with large chunks (that's one of those monster chunks right there in the middle of the pint) of real sliced bananas and then spiced up with a little rum and nutmeg. I should also point out before going any more in depth that I also do not like rum and nutmeg. Uh-oh...this isn't good. Anyway, the caramel ice cream had a slight brownish hue to it and slight caramel smell, so there was definitely an effort to sell the caramel angle. As for the rum and nutmeg, I could detect a slight hint of them in the smell, but in terms of visual appearances, it was just part of the ice cream itself. In order to not let myself be completely thrown off by this, I made an effort to taste the actual caramel/rum/nutmeg ice cream first and I've got to say that I liked it. It was burnt caramel (like the namesake dessert) and the rum and nutmeg provided some nice depth and kick to that ice cream. In fact, I really liked the ice cream itself, even if it did have a faint taste of banana from the large chunks that were spread healthily throughout the pint. Next, I took a spoonful that included one of the banana chunks and that's where this went all downhill. The chunks, due to their size and "real" quality, carried an overpowering banana taste and being that bananas are just about my least favorite thing in the world, that repulsed me. 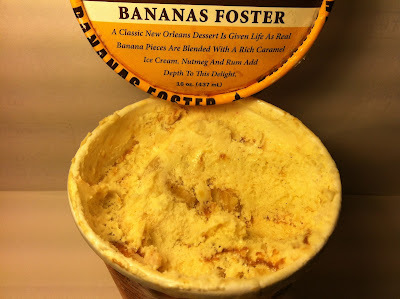 In fact, the banana flavor overtook what I found to be a pleasing flavored ice cream and after a few spoonfuls, I could go no more because I was overcome by banana. Ugh. Buy It or Fly By It? On a personal level, I give this a FLY BY IT rating due to the fact that I despise bananas. If you like bananas, you may in fact like this pint because the ice cream itself is actually very good. It's just the banana chunks that ruin it for me. Too bad, because if I liked bananas, I think I'd really like this one. Oh well...can't like everything, I suppose. why even bother reviewing it if you don't like one of the main flavors? He's kind of compelled seeing as they sent it to him to review in the first place. Thanks Nick, and yes, that is absolutely correct.